"Booked a meerkat encounter - what an amazing experience. You had us in fits of laughter the whole way through with stories about the Meerkat families … it was a lovely finishing touch to hold the reptiles. Would definitely recommend to everyone! The amount of care love given to the animals is clear to see. Just amazing!!! Thanks to all." 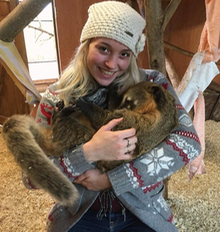 "I would HIGHLY recommend visiting the animal experience! We had the reptile & meerkats package and it was AMAZING!! The keepers are very knowledgable & informative on the creatures & the meerkat experience was probably one of the best things I've ever done! So worth it!! I want to go back!!" "Without a doubt one of the best experiences of my life! Lee and team not only have experience but clear passion and dedication to the animals! The team make the experience as much as the animals do, and should be incredibly proud of themselves for the awesome way that you make customers feel. In the words of the legendary Arnie, (hey great new meerkat name! ) 'we will be back!'" 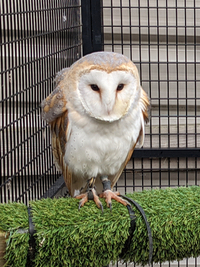 "An absolutely fantastic owl and bird of prey experience for my daughter's 18th. Victoria was so knowledgeable and we learnt so much. The birds were well loved and well looked after. We really enjoyed meeting them, holding them and even flying the kestrel and a barn owl. We will definitely go again and would highly recommend." "Amazing experience for my son's 10th Birthday, Chris was very patient with Leon and Georgia and extremely knowledgable. We had loads of time with the Meerkats and Reptiles and lots of handling. The kids thought it was epic and awesome and I couldn't agree more. Thank you so much and we will definitely be back." 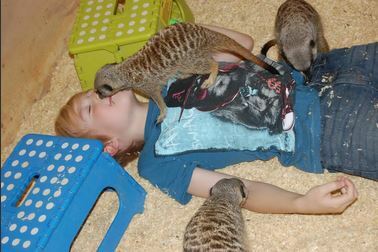 "My mum had a Fantastic time meeting the Meerkats, higly recommend The Animal Experience! Fantastic, knowledgeable staff and clearly happy animals." "Our family went on the Hawk Walk with Victoria, Jen, and two Harris Hawks. We absolutely loved it! We took the hawks out and walked the paths in the surrounding fields for about an hour and let them hunt/fly while we took turns feeding them along the way. Both Victoria and Jen talked to us about hawk behavior, hunting, care, and feeding. What was unique about this experience was that we were able to get to know both the Harris Hawks and the people that take care of them by watching them do what they love to do. Victoria was especially informative and has 10+ years experience in working with birds of prey. Both of our boys, ages 10 and 13, also learned a lot and really enjoyed this experience. Highly recommend the Hawk Walk!!!" When our animals are not out entertaining you, they find time to relax back at our zoo in Stretham. However, they are happy to welcome you if you would like to come and visit them in their home. When you visit you can choose from a range of packages and experiences, offering the same combination of entertainment, education and hands on experience that has always been our trademark but with an even wider range of animals... The standard packages that we offer are described below. If you don't see what you're looking for then please call us to discuss your requirements! Please note that the you can only visit the zoo by appointment, so contact us and we'll fix a date. Spend an hour getting hands on with our wide range of reptiles in the company of one of our knowledgeable keepers. 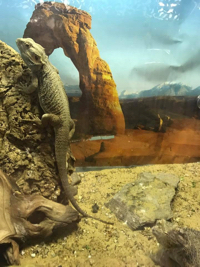 You will have the opportunity to touch and hold a range of reptiles from corn snakes to burmese pythons, bearded dragons to monitor lizards and tarantulas to giant stick insects. You will of course also get to see our other animals, but if you want to get hands on with these please see our other packages! Come and get hands on with our family of meerkats! Spend time really getting to know them: watch them, feed them and expect to get used as a human climbing frame! This is a unique opportunity to really get acquainted with these endearing characters. A truly once-in-a-lifetime event, this makes a fantastic gift for a special occassion -- with plenty of opportunities for photos and videos. £50 (+VAT) for 1 or £80 (+VAT) for 2. This is a great opportunity to learn about our amazing owls and kestrels, handle them and have one or two flown to your glove. Our falconer will be with you to answer any questions. This experience is for two people but you can bring along another two spectators if you like. After your 1 hour experience feel free to look at our marvellous meerkats, coatis and reptiles; or why not add on a meerkat, reptile or coati experience to make a really special day. 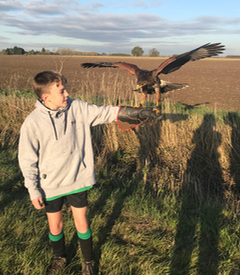 Come and join our falconer for a fun filled hour of walking in the beautiful countryside with Zip or Beau our wonderful Harris Hawks, you will be amazed as the Hawk follows you along the walk and comes regularly to your glove for some food! Wear appropriate clothing for the outdoors, wellingtons or sturdy walking boots. If the weather is too bad you can exchange for a Bird Of Prey experience and watch the hawk, owls and kestrels fly in our hanger or you can wait for a dry day to attend the Hawk Walk. Not for the faint hearted - this is an adult only experience... Although Coatis are incredibly gentle they have very large teeth and claws! They will happily eat from your hand though and may even climb on you - come into their enclosure to take some great photos.